Me: I’d rather split an atom in my kitchen. Me: Hm that sounds interesting. Once I made the escape from working mega-hours in network news to my current get-rich-slow career, Minister of Tile Labeling (an industry that Coco claims has the capacity to age the face faster than vodka), I had the time to make plans after work and on weekends. During the brief period before the economy capsized when I was paid a salary that resembled a living wage, I could indulge theatergoing with Milton to my heart’s content. Since my pay was slashed 20% nearly three years ago, I have had to make some tough financial decisions in order to feed my inner theatergoing beast. Yet, I know that my life will have entered freefall when I can no longer find a way to see the latest Stephen Sondheim revival or catch the transition from Off-Broadway to Broadway of one of the hottest new plays – the erotically charged Venus in Fur starring Nina Arianda (who originated the role of Vanda in the production staged at CSC in 2009), and Hugh Dancy. Arianda and Hugh - hot couple, hot ticket. Milton was particularly thrilled with the addition of Hugh to the cast. Milton: I’d see him play a tree! 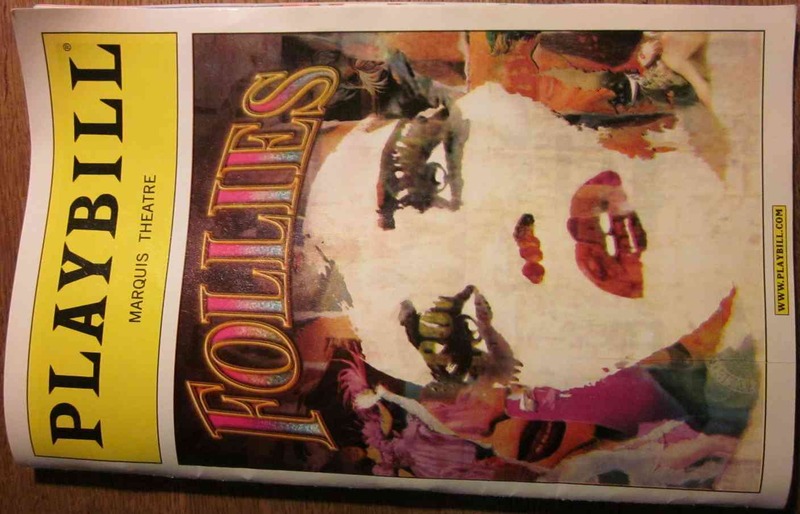 Due to my ongoing financial limitations, Milton and I attend far fewer Broadway shows now but he did score us deeply discounted tickets to see that latest Sondheim revival, the lavishly produced, Follies, starring Bernadette Peters and Jan Maxwell. They play long retired showgirls from a bygone era that reunite shortly before the theater of their youth is razed to make room for a parking lot. That description leaves a helluva lot out including thirty years of disappointment, disillusion, infidelity, suffering, humiliation and that treasured chestnut, rejection. All of these emotions are illustrated with powerful singing, excellent dancing and it’s haunted with ghosts. What’s not to love when a show this complex and elaborate is as beautifully staged as this revival? One thing that immediately comes to my mind is the 50-year-old mama’s boy sitting next to me with his date (yes, his mother). He mimicked the entire score from start to finish with a low, off-key hum, that I initially thought was either a new breed of mosquito buzzing outside my ear canal or I was channeling someone’s prolonged death rattle. Yet, even that unanticipated annoyance was incapable of destroying the brilliance of Sondheim’s inventive lyrics, but had I access to a polo mallet, a large sock filled with crushed brick, or simply a baseball bat, it is possible I would have ignored my inner pacifist and smashed Sonny’s head. Me: What was your problem with it? Milton: Anything Goes has raised the bar too high. This wasn’t at that level, so I was a little disappointed. B&W playbill for very colorful show. Last July, Milton and I scored 2 for 1 third row aisle Orchestra seats to this madcap Tony-award winning music comedy revival. It’s a Cole Porter masterpiece starring the reigning queen of Broadway, Sutton Foster play nightclub singer, Reno Sweeney. To put it in perspective about how terrific Anything Goes is, due to the boneheaded mistake of eating a single hot wing prior to curtain, I suffered near-debilitating heartburn apparently for the entirety of the first act. I say “apparently” because I was so completely captivated by the book, the elaborate choreography, spot-on singing and Sutton’s megawatt charisma, I did not realize until intermission that my feel sharp chest pain had escalated and it was possible that I was actually suffering a massive heart attack instead. Had I bought my rainbow while watching that show, I would have exited this life in toe-tapping bliss. Fortunately, a single hot wing is not lethal. I recovered during the second act that was as wonderful as the first. For me, this show was as healing as a visit to Lourdes. Theater is that wonderful. 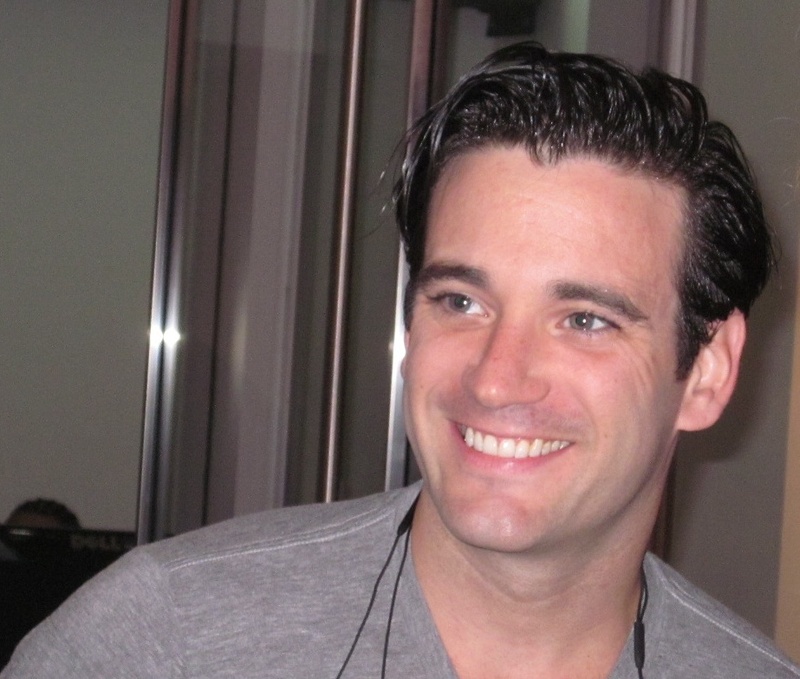 Collin Donnell, Anything Goes leading man outside stage door -- photographed by eagle-eyed Milton. 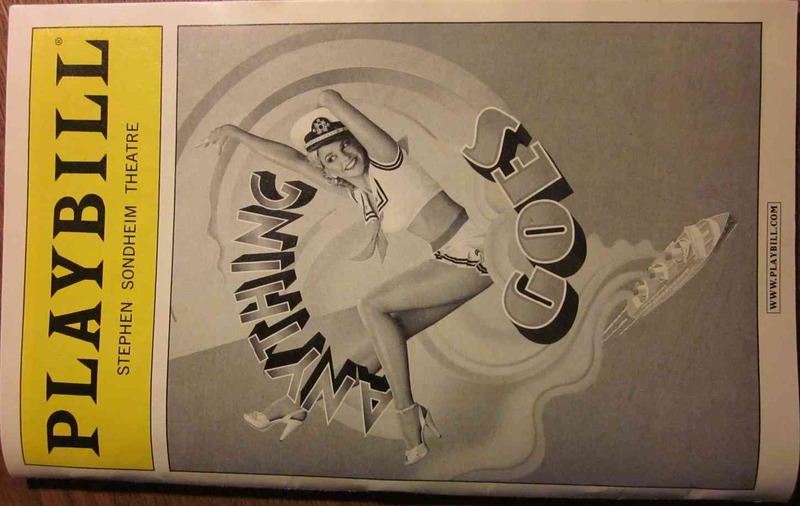 This entry was posted in Humor and tagged anything goes, cole porter, collin donnell, follies, hugh dancy, nina arianda, stephen sondheim, sutton foster, theater, venus in fur. Bookmark the permalink. You’re welcome, Robert! Thanks for checking in! Theater is, indeed, that wonderful! One of my dad’s greatest joys was taking us to see shows in NY–he adored it! The soundtrack to Anything Goes still plays on the hi-fi in my head, Kathy. Milton and I would love to see this one again, but we’re grateful to have at least seen it once. Wait…wait wait wait…vodka isn’t really aging is it? I don’t want to have to cut out my breakfast vodka. If you never work in tile, Natasia, I’m sure breakfast vodka’s as self-preserving as Oil of Olé (sic). Heard raves about Venus in Furs from my brother who saw it at CSC. Thanks for keeping me up to date on all the theater I have been missing since I am living full time in the north country. Keep getting those 2 for 1’s! Bev, ya gotta travel down to the low country, if only for a visit with Venus. Forget about seeing me!